Judicial Watch Asks "What Is The FBI Hiding In Its War To Protect Comey? As the James Comey saga continues to unfold, the James Comey legend continues to unravel. The more we learn about his involvement in the deep state’s illicit targeting of President Trump, the more reason the American people have to question both his motives and his management as director of the FBI, the now-disgraced agency he headed before Trump fired him on May 16, 2017. Comey has left a trail of suspicious activities in his wake. Comey now looms large over a burgeoning constitutional crisis that could soon overshadow Watergate at its worst. To deepen the crisis even further, it now appears some of Comey’s former FBI and Justice Department colleagues continue to protect him from accountability. Three suspicious activities stand out, all intertwined: The so-called Comey Memos, Comey’s controversial testimony before the Senate Intelligence Committee and Comey’s book deal. After Comey was fired by President Trump on May 9, 2017, he arranged to give the New York Times a Feb. 14, 2017 memorandum he had written about a one-on-one conversation with Trump regarding former National Security Advisor Michael Flynn. The New York Times published a report about the memo on May 16, 2017. Special Counsel Robert Mueller was appointed the following day. 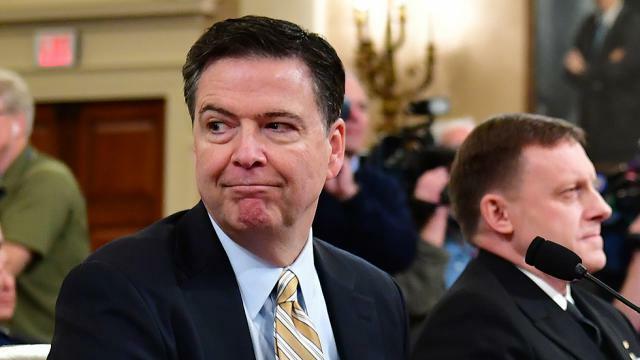 Comey also testified about President Trump’s firing of him, and he detailed multiple conversations with President Trump, during which Comey confirmed he told President Trump three times that he was not a target of investigation. Judicial Watch is pursuing numerous FOIA lawsuits relating to Comey’s memoranda and FBI exit records as well a lawsuit for Justice Department communications about Comey’s Senate testimony. The American people deserve to know what, if any, complicity his former colleagues had in drafting that testimony and/or in engineering the appointment of Robert Mueller. The day before Comey’s testimony, Fox News reported: “A source close to James Comey tells Fox News the former FBI director’s Senate testimony has been ‘closely coordinated’ with Robert Mueller…”. Comey may have violated the law in leaking his official FBI memos to the media, and it would be a scandal if Comey coordinated his Senate testimony with Mr. Mueller’s special counsel office. That we have had to sue in federal court to discover the truth speaks volumes. The FBI has built a protective stonewall around Comey by refusing to release the Comey Memos and refusing to disclose records of communications between the FBI and Comey prior to and regarding Comey’s testimony before the Senate Intel Committee. Since his forced departure from the FBI, Comey signed a book deal in August 2017, set for publication in April 2018, for which he reportedly received an advance in excess of $2 million. Given the fact that the FBI appears to be letting Comey get away with stealing and leaking official government documents and colluding with the special counsel to get Trump, even a trusting person must be suspicions about his book deal. The FBI has fanned those suspicions by, you guessed it, adding a new layer to the protective stonewall around Comey. Again, Judicial Watch has been forced to sue a recalcitrant FBI for records, including but not limited to forms Comey was required to complete relating to prepublication review of the book by the FBI. Did Comey’s cronies give the fired FBI director a pass on this long-standing requirement? Is that why they are stonewalling the Judicial Watch FOIA? Based upon Comey’s performance to date, this book likely will be an elaborate exercise in self-apotheosis. That’s why the American public deserves to know if Comey’s former colleagues — many of whom we now know aided in his exoneration of Hillary Clinton and have participated in the contrived investigation of Donald Trump – scrutinized his literary claims or simply green-lighted his every word. There is no doubt that the deep state is in deep cover-up mode. The FBI, Justice Department and the special counsel all are stonewalling our requests for Comey documents. The more they stonewall, the deeper the suspicions grow about Comey’s complicity in the entire attempt to use the bogus Trump dossier to prevent the election of Donald Trump, and then use it to undermine his presidency once he was elected to office. In my experience in Washington, when people refuse to come clean, it is usually because they are hiding dirty laundry.